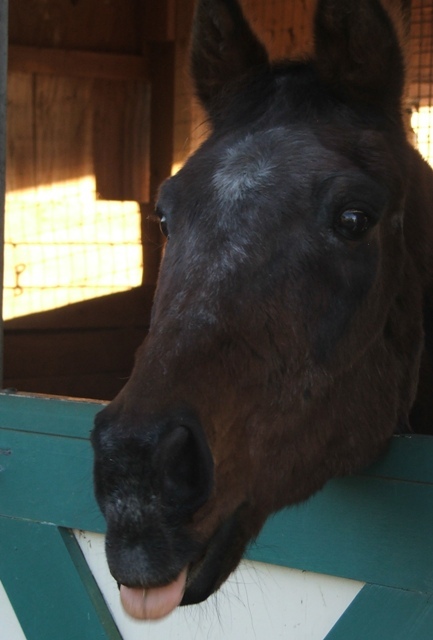 "In this hard economic environment, horse owners need to be sure they are getting the most for their money when it comes to their horse’s feeding program. 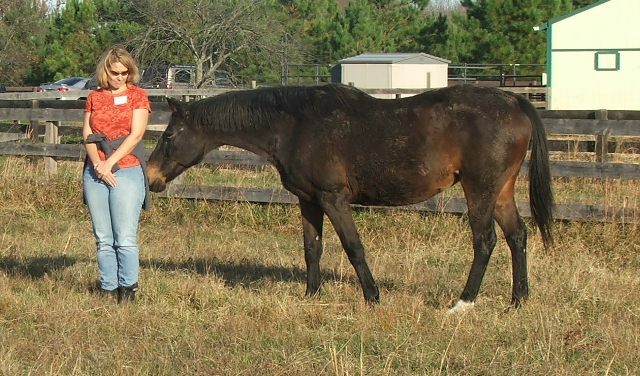 Dr. Carey Williams will help demystify supplements so that you can feed your horse cost effectively with confidence. 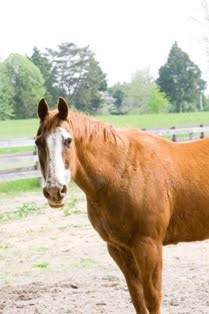 Dr. Williams will discuss a horse’s vitamin and mineral, joint, calming, herbal and various other supplements, when supplements might be beneficial, and how to use science based information to determine if your horse needs a feed supplement." Much to our chagrin, a recent visitor mentioned that we never "talk" about Henry on the blog. She's right. Henry's arrival was not a dramatic one. No starvation. No neglect. No abandonment. But Henry's story has developed into a noteable one. 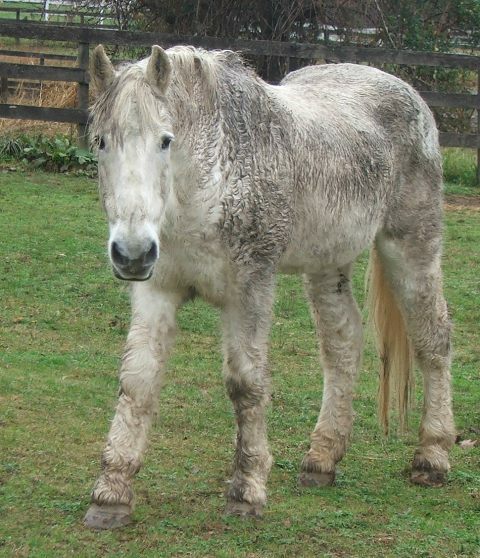 Henry, a retired eventer, arrived at Traveller's Rest about four years ago when his owner encountered very serious family difficulties. 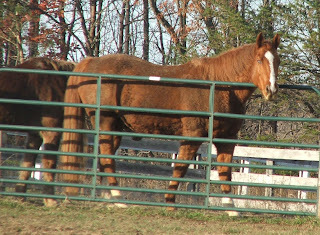 The big chestnut Thoroughbred cross actually came here on what was supposed to be a temporary stopover on his way to another sanctuary. 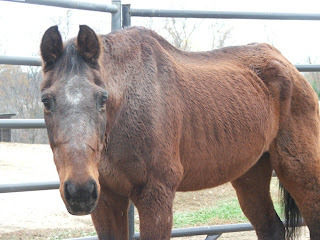 Watching his reaction to a big change in his life, however, led us to offer Henry permanent sanctuary here rather then subject him to another move in a short time. 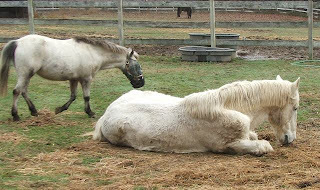 The second problem was Henry's behavior around other horses. He was extremely aggressive, more so with mares than with geldings, and on two occasions drove horses into corners and attacked. 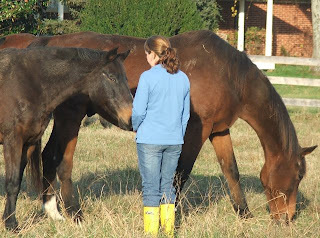 After several attempts, over two years, to find just the right companion, we resigned ourselves to the idea that Henry didn't possess even basic equine social skills that allow most horses to live in herds. 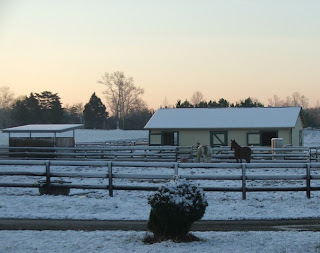 He was set up with his own paddock, with "fence buddies" on three sides, and a shed he could share with other horses, but with separate access doors and a partition between himself and the others. Two years after his arrival, Henry was diagnosed with Cushings disease. Was that part of the problem? We've seen no published information on this, but have observed more than once that extreme irritability in a previously good-natured horse is one of the first signs of Cushings. Before "the coat." Before the weight gain. Before most other observable symptoms. 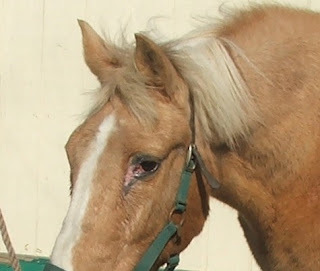 Henry was started on Pergolide, and seemed to respond in terms of physical symptoms, but he was still very irritated by other horses in close proximity. At this point, we were very leery of putting another horse's safety at risk and decided Henry was going to be a loner for whatever years he had left. He seemed content enough on his own, but not entirely happy. Then, almost a year ago, Henry met a new friend. A wonderful lady named Carole came into Henry's life. Carole has attended Reiki workshops at TREES and was attracted to Henry from her first visit. 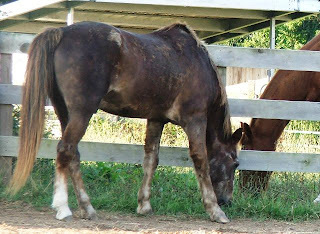 The two formed a friendship that even observers new to horses noticed. 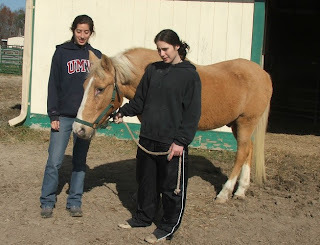 When TREES later became a founding shelter member of SARA (Shelter Animal Reiki Association,) Carole signed up as a volunteer and began visiting Henry every week. The practice of Reiki in human hospitals has been shown to promote healing though relaxation and stress reduction techniques. Those same techinques helped Henry heal whatever mental or emotional issues he dealt with for several years. There was no instant "fix." No flash of light or fanfare. Carole has been working with Henry for several months. Gently, steadily, consistently helping him relax and accept things previously deemed out of the question. No matter how you look at Reiki, the results for Henry have been life-changing. We're forever grateful to Carole for sticking with Henry and giving him the ultimate gift. He's no longer just content. He's happy. 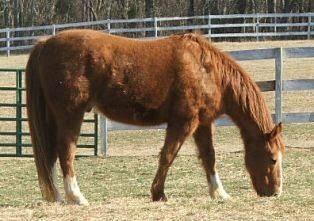 We were very disappointed to learn that horse.com/Country Supply has discontinued its CARE program. For years, when shoppers entered an organization's "Care Code" at checkout, a percentage of the purchase total was donated to that organization. That will no longer be the case. 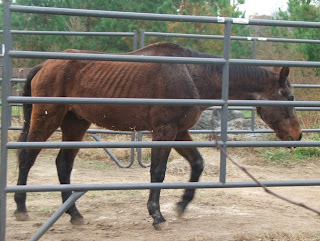 We're disappointed in this change since TREES' supporters actually built quite a little cooperative donation base while shopping through the horse.com site. A further disappointment was the decision to not distribute what credits organizations had built up in their accounts at the time the program ended. Bottom line, folks, is that if you were shopping at horse.com more to generate donations than because it was your first choice in horsey retail, you no longer need to factor that into your shopping decisions. HOWEVER! 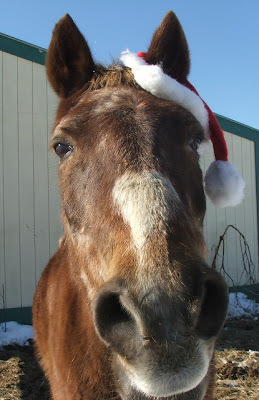 We're still members of the iGive mall, and with holiday shopping moving into full swing, that is another way you can support Equine Elders without spending any extra money yourself. Visit the TREES page at iGive to sign up. "Searching or Shopping means a donation. It's just that free and easy. A penny or more per search, a $5 bonus for your first purchase and up to 26% of your purchases at over 730 stores like Amazon, eBay, Travelocity, Home Depot, Staples, and many, many more. Plus you SAVE money with exclusive coupons/free shipping deals." Hundreds of well-known stores offering everything from pet supplies to inkjets to chocolate. happy shopping! Many offer specials, sales, coupons and other extras, just like your brick'n'mortar mall, but without the crowds. The more you buy, the bigger your donation to TREES! Now don't you wish you'd started here instead of in a mile long line at 5AM? 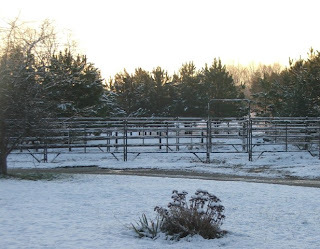 We are thankful for all the support, moral, financial, physical and spiritual, that allows TREES to fill its niche in the world of horse welfare. 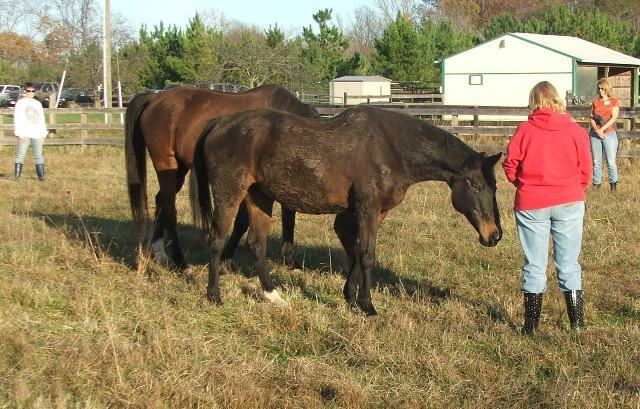 We are thankful for being able to work with a veterinary practice, Rappahannock Equine Veterinary Clinic, that not only understands the needs of geriatric equine, but also offers TREES’ residents the same level of customer service that is offered to show barns and top of the line breeders. We are thankful for every single individual that offers TREES the gift of time, whether he or she comes to the farm weekly, monthly, or occasionally, or staffs special events, spends time researching funding or PR opportunities, works at home, hauls horses, picks up supplies, photographs residents, you name it. You ALL make it work. We are thankful for students of all ages, who choose senior horse issues as the focus of field trips, community service or research projects. We are thankful for animal control officers in surrounding counties who see the line “he’s skinny because he’s old” for the myth it is. 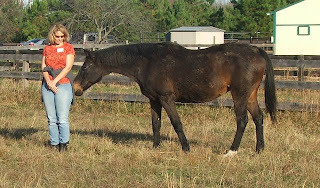 We are thankful for owners of elder horses who ask for advice rather than fall for that same myth. We are thankful for Ernie Haynes' weekly farrier visits, and his patience with residents who may not be able to lift a leg as high as they did when younger, or who need a little break between feet. We are thankful for continuing support from “non-traditional” care providers like Jill Deming of Integrated Animal Therapies, Janet Dobbs of Animal Paradise Communication & Healing, and the many volunteers of our Shelter Animal Reiki Association program. We are thankful to Snow Hill Farm for delivering what seems like a mountain of Triple Crown Senior feed and forage cubes. We are thankful for the Equine Rescue League (who will celebrate its 20th anniversary next year,) for inspiring the founding of TREES. 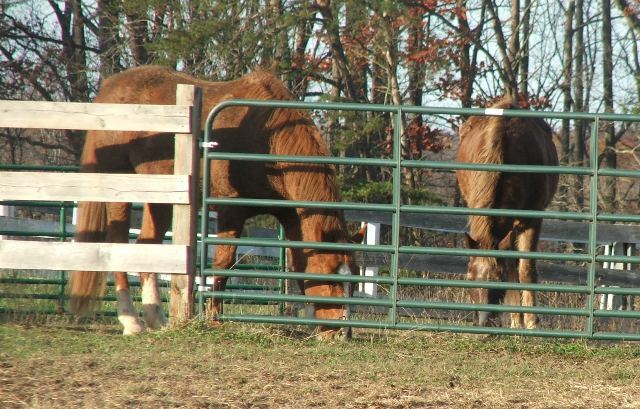 We are thankful for area businesses like Tractor Supply Company and Dover Saddlery, that support horse welfare efforts. 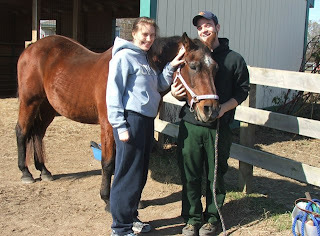 We are thankful for Scarlett Grove Stables for retraining a returnee and networking to find the prefect family for her. We are thankful for Greg Flynn, at Desyne.com for hosting our current web site and for the new layout. And we are thankful for all of the new friends we meet every year, whether human or equine, veteran horseman or beginner, young or mature. You inspire us with your ideas, motivation and support. Thank you all. Happy Holidays. All Tuesday Talk lectures will be held at 7 p.m. in the Marion duPont Scott Equine Medical Center's library, in Leesburg. No fee is charged for attending, but seating is limited and pre-registration is required. 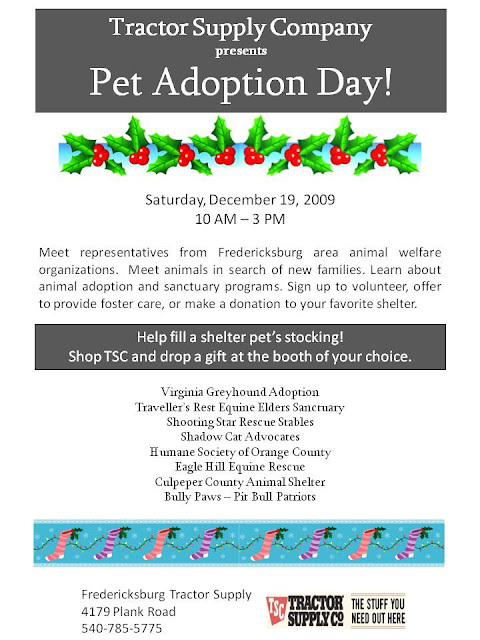 To register e-mail Amy Troppmann or call 703/771-6843. Additional information regarding the center and its services is available online. Contact Kate Lee at cleepr@vt.edu or 703/771-6881. We'd like to thank Caroline B. and her family for dropping by for a visit today. 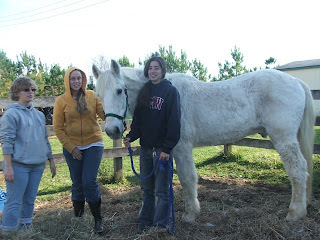 For her senior project, Caroline chose to do a presentation on senior horses. As part of that project, she built a display which featured some of TREES' residents (Miss Mona in particular) to take to local horse shows, and also collected donations and used tack for Traveller's Rest to use in fundraising efforts. Today TREES was presented with 8 saddles, among other items, that will be used to generate funds for residents' care. Caroline will also be building a PowerPoint presentation as the final phase of her project. We hope she'll send us a copy! As a side note........Sherman - (formerly) timid, detached Sherman - thoroughly enjoyed Caroline's company and I think would have stayed right next to her as long as she stood in one place. Thank you, again, Caroline. Hope you enjoy your holiday weekend in DC! One of TREES facebook fans (Thanks, Michelle!) asked if we would share Sherman's diet plan. "Oh, sure! Before he got here, Sherman was obviously not getting much to eat, let alone getting a good diet. When he did get anything in addition to some hay, we were told it was an inexpensive general livestock grain. 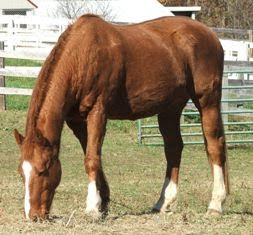 Usually that means a lot of whole oats, whole corn and other whole grains that an older horse can't chew and, therefore, can't digest. When he got here, he'd had very serious diarrhea for some time. For his first meal, he got half a flake of grass hay. No senior feed right then. 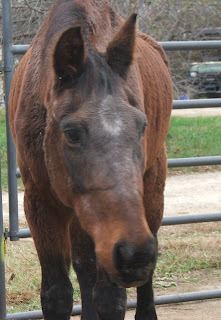 At the next meal, he was offered 2 cups of Triple Crown senior feed, soaked, then another half flake of hay. 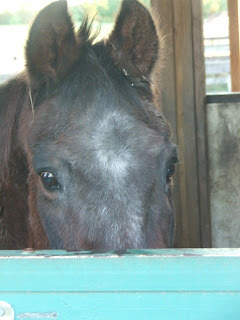 (He is given senior feed in four small meals during the day.) The next day, we gave him a whole flake of hay at a time since he didn't seem to be wolfing it down. On the third day, we began slowly increasing the portion of senior feed and introducing small handfuls of soaked alfalfa cubes. The only thing we added to the hay and senior feed to this point was some ProBios. In general, unless recommended by the vet, we try not to introduce a lot of new things to a gut that's already in an uproar. After about 5-6 days, the diarrhea was more of an intermittent problem rather than a constant issue, then we figured out that some of the hay had clover in it and that seemed to be what he was sensitive to. 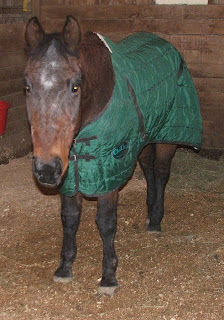 We eliminated the clover and started adding Accel (thank you, Dover Saddlery!) to two meals a day since it contains probiotic ingredients. 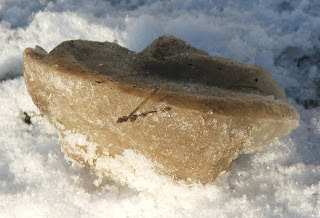 That seemed to do the trick, and though Sherman occasionally has softer manure than normal, its still well formed and not a major concern at this point. 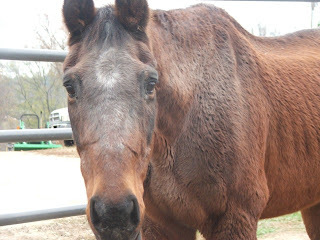 Right now, Sherman is eating four meals a day, each consisting of 2-1/4 qt of senior feed and 1-1/2 qt of alfalfa, free choice grass hay and Accel 2x/day. Since he does still have some soft manure now and then, we're going to be very cautious introducing him to grass. We'll probably continue to increase his feed portions until he's getting 3 quarts 4x/day and maintain that diet until he regains the weight he needs. Keep in mind that this is a customized Sherman Rehab Plan. 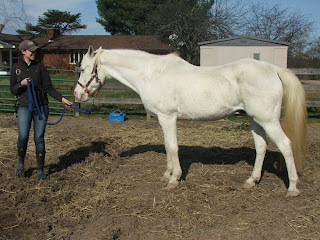 We have a general outline we follow for each horse, but the details are always different." Yes, Nathan Fans, what you are looking at is a horse that is muddy on both sides of his body. Why is that odd? Wellllllllll, if you recall, when Nate first arrived, he could only get to his feet if he slept or rested on his right side. 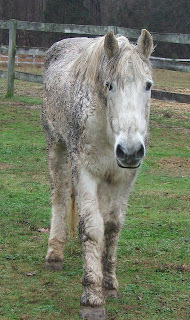 What you are seeing here is a horse who is able to roll around in the mud on BOTH sides and get up under his own power. Bravo, Natey! Baby steps for some, leaps of faith for Nate's supporters! Thank you to everyone who encouraged us to not give up on this grand gentleman. Sonny's prior owners told us that, for years, Sonny suffered "blocked tear ducts," which caused the hair loss just below both eyes. 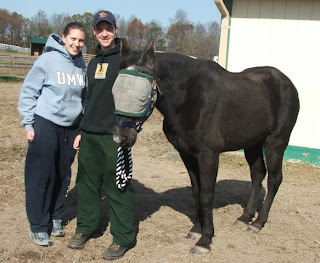 That diagnosis was confirmed by two veterinarians following Sonny's arrival at TREES. When they hear the term "blocked tear ducts," many people believe that means that Sonny either does not produce tears or that the tears cannot get to his eyes to flush out irritants or to keep them lubricated. When that little duct is obstructed for any reason, the tears cannot drain normally, spill out over the lower eyelid and run down the face. In some cases, the duct can be reopened, but Sonny's blockage appears to be a permanent condition and we don't want to put a 38 year old through any invasive procedures for something that causes no real discomfort or presents no health risk. 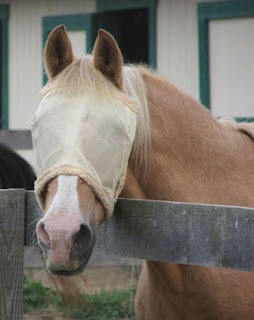 Sonny wears a fly mask much of the time since the eye discharge attracts flies and because the hairless skin sunburns easily. Other than that, Head King Alpha Dude only requires a little extra facial grooming to be kept comfortable. Sherman met Ernie today. Seems our new guy has a couple of problems. Not all necessarily foot problems, but problems that became apparent when Ernie asked Sherman to stand on three feet or to bend a leg a certain way. It goes without saying the today's trim was aborted and will not be attempted again until we get a better idea of the source of pain and can resolve the discomfort. 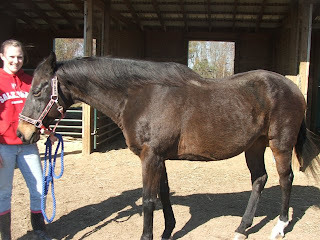 One obvious issue was an "old" abscess in the right hind that may not be entirely healed, though Sherman appears to bear weight on that foot normally. More evaluation needed there. 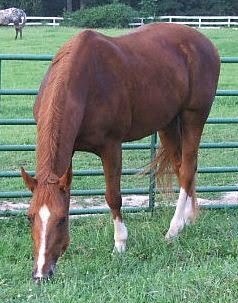 The left hind is painful when lifted more than a few inches off the ground. More evaluation needed there. Sherm didn't want to lift the right front when he needed to bear more weight on the diagonal. So, Mr. Sherman only had his left front foot trimmed today. But what a trooper he was. He tried to do as he was asked and actually seemed a little confused that we didn't force the issue. There was no reason to insist since the current condition of his feet presents no emergency. So begins the process of solving another puzzle. What hurts? How much? Will the discomfort lessen as Sherman gains weight and rebuilds muscle to support his joints? Will stiff joints loosen up as we being to reintroduce regular exercise? Meanwhile, as long as we are not asking him to bear weight in an unusual way, Sherman seems quite happy. He is eating well, coming outside to enjoy the sunshine most of the day, and becoming more and more curious about events around him. There may be a real clown lurking under there. A few shots from the Reiki Level 1 Workshop at TREES today, conducted by Janet Dobbs. Three inches of rain Wednesday and still coming down. 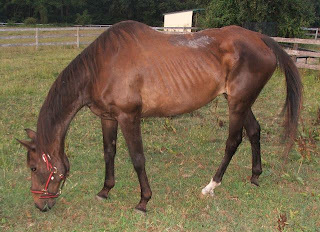 Mona two days after being removed from the Polo Pony Retirement Foundation. 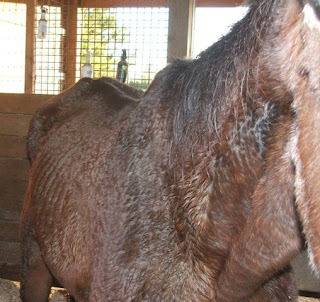 While we were hoping to gain some insight at the trial as to why this happened to Mona and her herdmates, we can now put this behind us and focus on the future. 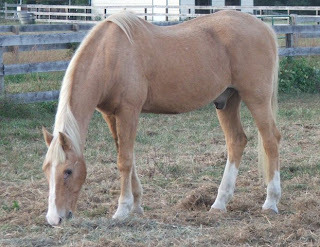 Its long been known that the administration of oral or injectible steroids like dexamethasone could cause complications in horses with Cushings. This study shows that steroids in topical creams can be absorbed through the skin, causing measurable amounts to show up blood samples. "We were really surprised to see such massive systemic changes in such a short time," Abraham said. 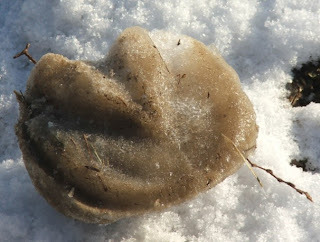 "And this was in healthy horses. 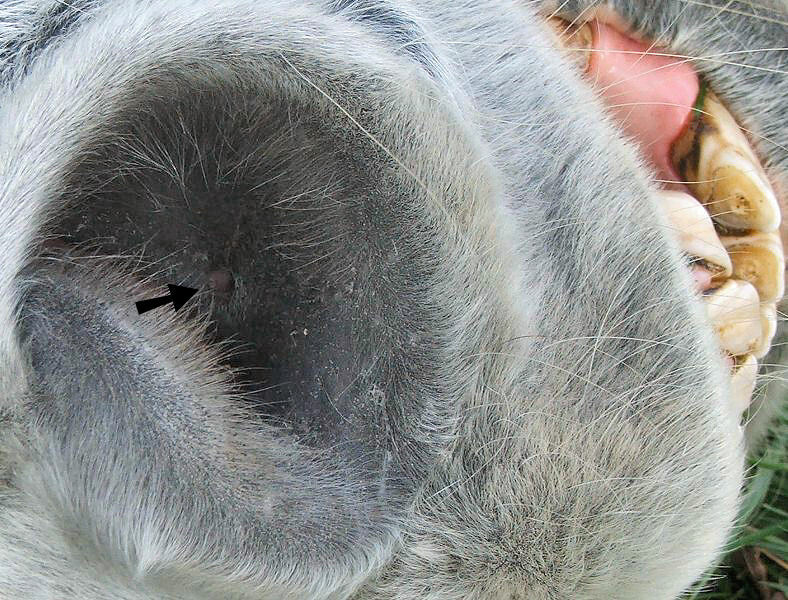 The study, "Effects of dermal dexamethasone application on ACTH and both basal and ACTH-stimulated cortisol concentration in normal horses," was published in the August 2009 Journal of Veterinary Pharmacology and Therapeutics. Sometime last night, the shell cracked open and, both literally and figuratively, Sherman emerged! Rather than staying sequestered in his stall all day and night, Sherm is now strolling outside on a frequent basis. His eye has softened, he's inquisitive and seeking attention. A far cry from the timid guy of the past few days. 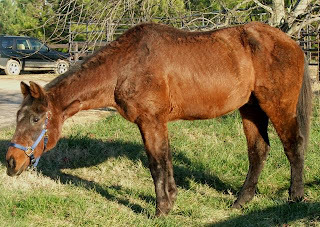 Because he is very thin and is showing some physical signs that may point to Cushings, we are proceeding cautiously with Sherman's refeeding program. 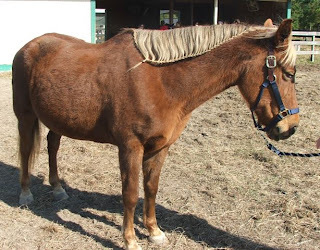 Lack of weight can sometimes mask the severity of illnesses like Cushings and we want to avoid tiggering any complications like an episode of laminitis. It appears Sherman is over his suspicion about the camera being a predator. Don't be surprised if you see a lot of closeups of his nose from here on out! I just realized we frequently talk about our Cushings Club, but we've never really told you who the members are. The official membership stands at six, but last summer's testing revealed two more may be at the jumping off point. As we mentioned a few days ago, our new arrival, Sherman, looks pretty suspicious as well. Not long ago, a diagnosis of "Cushings Disease," now known as PPID (Pituitary pars intermedia dysfunction,) was viewed by many as a death sentence. Not any more! 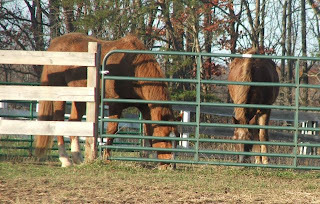 Interestingly, all are geldings. All are managed with pergolide and a carefully controlled diet (thank to all of our visitors for being very understanding about our "No Treats" policy,) and all are retested each year with pergolide dosages adjusted accordingly. Gifts continue to arrive no matter what time of year it is! Thank you, Tim, for the muck bucket full of goodies: Five new breakaway halters, cotton leads, ivermectin, a complete grooming kit, Swat ointment, Vetwrap and a clock almost too nice to put up in a barn. It may need to go on the porch or in the room used for small tour groups.Thank you, too, for your generous contribution directly to TREES' account at REVC. We look forward to seeing you again soon as a volunteer. And Trish! Toothless Wonders, one and all, thank you for 50 lbs of alfalfa cubes as well as the grooming supplies. The extra soft brush and curry are perfect for new arrivals like Sherman that may be carrying little flesh over their weary old bones. Since we've seen more bot eggs this year than we usually do, the bot knife is particularly welcome! At the risk of sounding a little repetitive, we could not offer TREES' residents the level of care we strive to meet without community support. 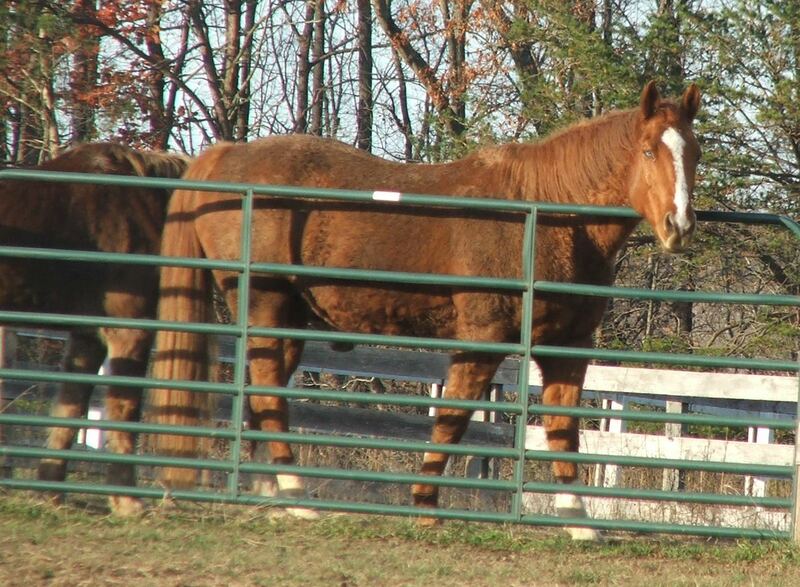 Every gift, big, small, cash, goods, or time, adds to the sanctuary's ability to execute its stated mission and goals. The defendant in the "Polo Pony Retirement Foundation Case" passed away on November 4, 2009. There will be no trial. 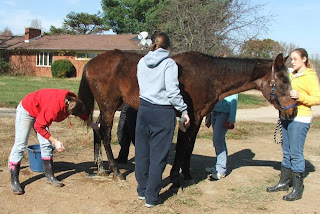 Thank you to all the members of the University of Mary Washington Pre-Vet Club who spent the day grooming geezers. Other than a slight wind, the weather was perfect. Most of the horses loved the attention, though a couple of grumps would have been perfectly happy keeping their hard earned dirt. Perhaps most importantly, our new resident, Sherman, was partially bathed to remove evidence of a light digestive upset from his hind legs. The New Guy seemed completely relaxed during this procedure, a far cry from a few other residents who declare they've never seen anything resembling a water hose or sponge in all their 30+ years. Thank you, all! Please come back any time. We'd love to see you again. Here he is! Our new resident, Sherman (29,) is quite thin, but happily not as underweight as either Mona or Liz upon arrival. It also appears, judging by the thick curly coat, that TREES may be adding another member to the Cushings Club. 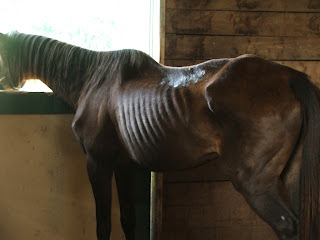 Sherman, shortly after a small (too small in his estimation) meal of Triple Crown Senior. For now, Sherman seems a little disturbed by the camera, but we were able to catch him peeping over the door at us. 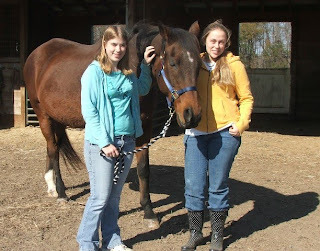 Thank you, Janie for helping bring this together, Amanda for filling in some details, Karol for the extra careful ride, Lori for offering Reiki when Sherman arrived, George, Heather, Catie and Jeanelle for helping to prepare Sherman's apartment, and everyone else following Sherm's arrival. 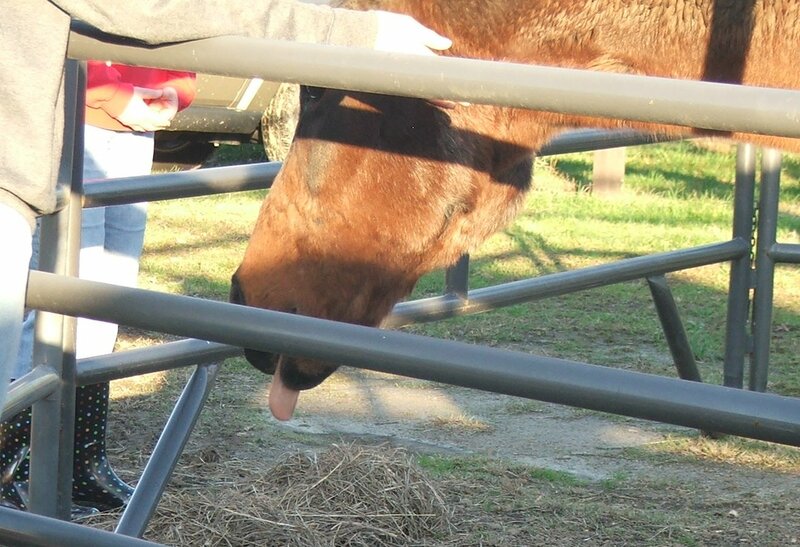 Our new man was a little tired after his short trailer ride, so we're trying to give him some privacy for the evening. We'll try to get more photos and post more information in the next several days.